A top Metro Transit Police officer said when he tried to offer help to D.C. Fire crews during a deadly smoke incident on Metro last week, he had a window rolled up in his face. This senior Metro Transit Police official, who spoke to News4 on the condition of anonymity, said the proper unified command structure was not followed Jan. 12, and the D.C. Fire & EMS Department was unwilling to participate in that unified mode. "It was almost as if we were a bother to the fire department," said the official. Meanwhile, smoke filled an underground Metro tunnel and a Yellow Line train within it, leading to scores of injuries and the death of 61-year-old Carol Glover of Alexandria. In a normal unified command structure, all first responders are supposed to gather at a designated command center. It is usually marked by a green light on top of a vehicle. The transit officer said when he showed up at that vehicle and told the D.C. Fire incident commander that evacuations needed to take place, he was told that D.C. Fire had to assess the situation before anything could be done. "There was no discussion. He left us standing out in the rain," said the transit officer. When contacted Thursday, a D.C. Fire spokesperson did not know immediately who the incident commander was at L'Enfant Plaza. According to the NTSB, thick, heavy smoke began flowing into the Yellow Line tunnel shortly after 3 p.m. The transit officer, who said he first arrived on the scene at 3:28 p.m., said it took time to "chase down" the D.C. Fire incident commander who was moving in a vehicle from block to block. In addition, when it became clear that D.C. Fire radios were not working in the L'Enfant Plaza station and tunnel, this transit officer said he offered to link up Transit Police officers who had working radios with firefighters, so that communication could be seamless. But he said that offer was never accepted. 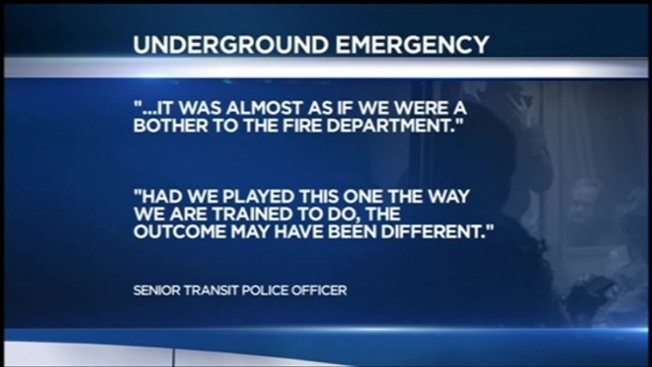 "Had we played this one the way we are trained to do, the outcome may have been different," the transit officer said. A D.C. Fire official who also asked not to be named disputes these claims, saying he was on the scene that night and there was plenty of "face to face" contact between D.C. Fire officials and Metro Transit Police officers.